How to define Korat cats? Imagine a beautiful silky gray cat looking at you with huge bright green eyes. Light shimmers like silver on its coat. You look back and realize you are seeing hearts. Your trace the form of the cat’s head from its chin to the ears and back – a perfect heart. Then you notice another heart from the muzzle around those luminous eyes and back. Then you notice the pretty blue nose is heart-shaped also. And yet another heart is formed by its coat on its broad chest. You look at those huge green eyes that look like they are lit from within – and you realize you are looking right into the fifth heart of the cat – the most important one. It is that special heart that loves people. This cat devotes itself to its humans, and loves them unconditionally. Elegant, loving, beautiful and ancient. Suddenly you understand why a cat can be so loved that in ancient times Korat cats were not allowed to be sold, only given as a gift of good luck. For who wouldn’t be lucky to have such beauty in their lives? The Korat cats are an ancient and rare breed. Actually the Korat is one of the earliest known breeds and one of the few purebred cat breeds in the world. Out of these purebred cats the Korat is one of the purest, some say the purest, a breed that resembles their original look more than any other cat breed. You get a good overall view of a Korat in the following photo of Sulo - whose official name is IP Dewdrop's Chai Sot Soo-Ay. (The copyright holder is Nina Sjöholm, do not copy). Korat cats are the descendants of the jungle cats of Malay Peninsula, and they developed through natural selection. This probably is the reason why it is such a healthy breed – nature took care that only the healthiest cats survived. The earliest written record of the Korat cats is The Cat Book Poems, Tamra Mao, which was written during the Ayudhuya period of the history of Siam. This period extended from 1350 to 1767 AD. The earliest picture of Korat cats can be found from this ancient literary work which is held at the Bangkok National Library (if you go there, you will find it in the Fine Arts room). So at its earliest the Korat cats may have been recognized as a breed already seven hundred years ago. In any case it certainly is one of the very first cat breeds mentioned in history. The Tamra Mao depicts paintings and verses about cats. It defines 17 breeds of cat that bring good fortune to their owners (and six that bring bad luck). 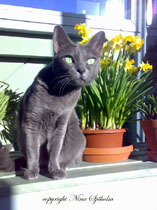 The Korat, of course, is one of the good-luck cats. Korat cats are considered lucky for many reasons. Its Thai name –Si-Sawat can be explained so that the word “si” means color, and “sawat” is the color of a Sawat-fruit, which is a mingle of grey and light green (as compared to Korat’s grey coat and green eyes, also described like “dewdrops on a lotus leaf”). The grey color was said to be the color of rain clouds - “the base of each hair is the color of a cloud”, explained the Siamese. When a cat’s color is that of rain clouds and the eyes are the color of young rice shoots, you may understand why the breed was considered lucky. In ancient times you really survived if you had food – and that meant good crops. .. A good rice crop was essential to your prosperity – your whole survival. Add to that the silver sheen of the Korat’s coat that reminds you of other kinds of riches and the connection to good luck is obvious. The Korat area is a plateau in north-eastern Thailand. The Korat cats are said to have lived in the Ampur Pimai district, which is a large, wild, sparsely populated area where there are huge grey granite outcrops. A popular legend from the area tells that the cat was the color of this granite, and this helped it to hide during the constant wars between Siam and its neighboring countries. There are many traditions and legends which tell this cat was deeply appreciated by the Siamese people for a long time. First of all, in its homeland, the cat was not to be sold. It was only given as a gift to respected people, the idea being that it would give good health and fortune to its new owner. If the cat had a crooked tail, then all the better (and if it did, then it was really never ever to be sold, but only given away as a sign of appreciation and respect). 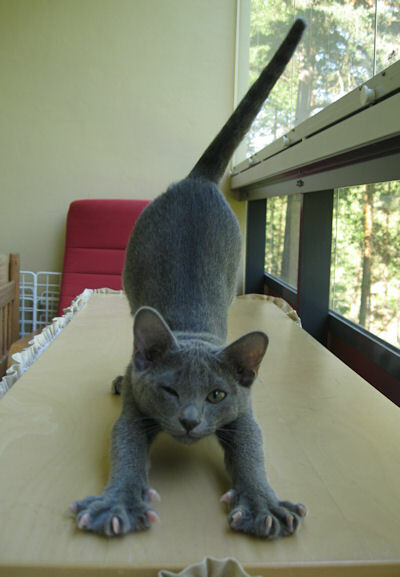 A totally kinked tail in a Korat was considered to hold the luck in. The owners, in turn, tried to keep their Korats inside the house as much as possible so that their luck would not run away. Newlyweds (especially brides of higher ranks) were given a pair of Korats on their wedding day to ensure their long and happy marriage and a prosperous home. To merchants Korat cats represented wealth (the silver sheen), to farmers it represented rain clouds (essential to good crops). In their native rural area a Korat was carried in a procession to a well. There it was sprinkled with water from the well to ensure good rain for the rice fields. One legend tells that male Korats accompanied Siamese soldiers to battle – perching on their shoulders they hissed and growled at the enemy, raising fear in them, and encouraging the Siamese soldiers. The Korat cats were appreciated also as watch-cats. They have a very acute sense of sight , smell and hearing, and the Korat will warn if any stranger tries to approach its home. It was considered as a good “watch-dog”. It even growls like a dog as a warning. 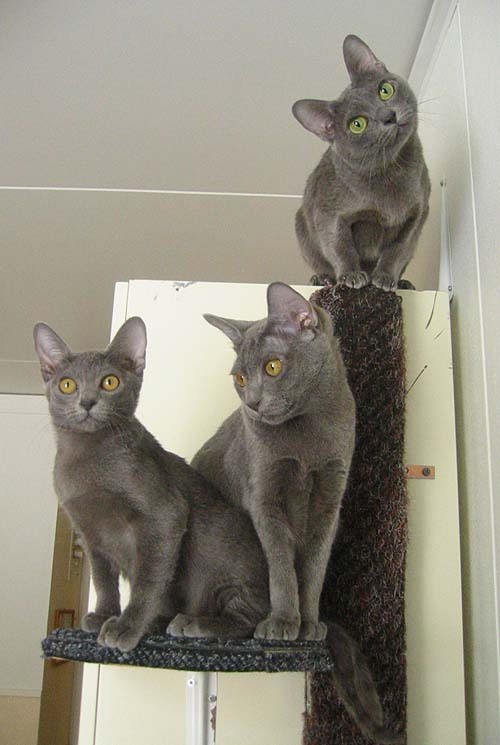 Thank you, Outi Niemi from POISON'S (FIFe) / THAIOUT (CFA) KORATS for permission to use this photo of Freia, Kustaa and Paavo - a good example of the alertness of the Korat cats. It was very hard to find any Korats and get them out of Thailand as they werer rre, but in the 1960’s this finally happened – the first Korats, Nara and Darra arrived in the States and from this moment the rest of the world became of aware of this grey beauty of a cat. There is one reference in Europe of a cat that was probably a Korat being shown in a cat show in Great Britain in 1896. The cat was shown in the Siamese class but the judge was of the opinion it was not a Siamese because of its blue color. The cat had been obtained from Siam by its owner, so it just might have been the very first Korat in the Western countries. Finally the Thai government also awoke to recognize this unique cat breed, and pronounced it as a national treasure. As a result of this, it is now very difficult to bring any Korats from Thailand. But still – every Korat cat must show its lineage back to Thailand to be a Korat. The character of the Korat is just as lovely as its beautiful silvery appearance and deep green eyes. It is very much people-oriented, you could even say people are truly important to a Korat. It wants to be with its bonded human no matter what. So if you own a Korat (or rather: the other way around), you will have a constant companion that follows you around everywhere you go. When you come home, it greets you by the door. If you go to a shower, the Korat sits nearby, observing you and the water with keen interest. If you wash laundry, it will supervise the process. If you write with your computer, you can be certain your Korat is right there to check the spelling for you. It sleeps in the same bed as you. The Korat wants company. If it is cats, it prefers its own kind. It is not good to have a Korat as a lonely cat, especially if you are away much. They may get depressed and even show aggressive behavior because of their unhappiness. Thank you Outi Niemi from POISON'S (FIFe) / THAIOUT (CFA) KORATS for the permission to use this photo of CH Melodian pa yah yahm eek "Paavo". Also they are very sensitive to loud noises and prefer a more quiet home. So even though they are good and tolerant with younger children, they may prefer a home where the children have grown up a bit. For this same reason: if you plan to take your Korat to cat shows, you should begin to teach it to tolerate loud surroundings when it is a kitten. But do take this one step at a time, not too much noise at a time. Still, there are times when the Korat wants its own personal space also – probably to analyze all it has observed about its family. But most of the time it just loves being the center of attention. The Korat cats are very playful and extremely intelligent and like to please their owner. They also love praise. This playfulness does not show any signs of slowing down with age. Because of this it is easy to teach them to fetch and if you try to wait until the Korat tires of the game, you’ll find yourself throwing the toy as long as your arm can take it… The Korat is an entertaining cat, but it also expects to be entertained. Is the Korat a talkative cat? Well – some are more than others. Also their voices can differ a lot. Some Korats discuss with their people in low chirps, some give a good holler – if the situation requires it. (This loud speak should not be mixed with aggression, it is simply a way of getting you to pay attention.) Whatever the case, the Korat gets its message across when it wants to. Some really spend their days in constant discussion with you – and they expect you to answer back. Don’t worry if you notice you have begun to miaow with your cat – the Korat expects you to do that, and besides you should remember it is always good to learn new languages. 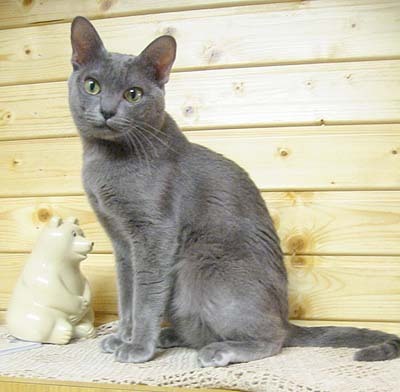 Those who have been chosen by a Korat say there is no other breed like it and the “Korat people” are totally devoted to their silvery grey beauties. It is truly an affectionate companion to you and bonds with its family very strongly. The more your show your love to the Korat, the more they love you back. Their character is sweet and gentle – but they have an iron will and strong opinion about what they like and dislike. They are quite territorial and want to be the top cat of the household, and want to define the hierarchy of the house, but once they feel they have this position, they are the sweetest cat you can imagine. They allow you to live in their territory and make sure you know they are quite happy to have you. The Korat cats are absolutely certain that the world was created for them – and revolves around them. They also extend this belief to their kittens – they are totally devoted to their mothering and always take care of their kittens first (so no wonder the kitties learn they are the center of the world – because to a Korat mother they are). Korats also allow their humans to handle their kittens and trust them completely. 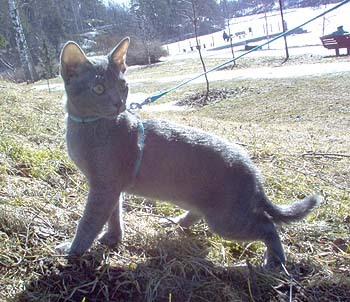 Because of its hunting instincts a Korat is ever ready to slip outdoors, so be careful with the doors and windows. But when their need for activity is taken into account, they are happy indoor cats. Still they learn easily to walk on a leash (of course the easier the sooner you start the training of a kitten), so you don’t need to confine your cat to a life indoors. Here Seirene Vajiravudh, or "Ramses" shows how this is done. Thank you, Outi Niemi from POISON'S (FIFe) / THAIOUT (CFA) KORATS for permission to use this photo. This certainly is one of the cat breeds with the most distinct and adorable personality. A perfect choice to someone who is prepared to adore a cat and be adored in return. Read more about the Korat's looks here! You'll find Korat breeders here. Thank you to Outi Niemi from POISON'S (FIFe) / THAIOUT (CFA) KORATS for the permission to use this photo of Helmi's Jai Sapparot - or "Urpo" to his friends. Are You Owned by a Beautiful Korat ? Tell us what is special about your Korat! What was the funniest thing it did? How did you get to be owned by a Korat? What kind of a purrsonality is your Korat? Tell the name of your Korat. Your story will appear on a Web page exactly the way you enter it here (minor editing may occur). You can wrap a word in square brackets to make it appear bold. For example [my story] would show as my story on the Web page containing your story. Do you have some pictures of your Korat? Great! Click the button and find the first one on your computer. Select it and click on the button to choose it.